William Tally Mallon’s parents were both from Tyrone but emigrated to America. William and Mary Ann had one son, born on 15th April 1899 in Germantown, Philadelphia, Pennsylvania. His father died three months after William Tally was born.His mother remarried and when William was about 6 years, the family moved to New York City. 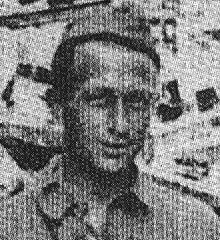 William Tally Mallon enlisted in the New York 165th Infantry in April 1917, not yet aged 17. Private Mallon was killed on 29th July 1918, at eighteen years of age, at the Battle of Ourcq near Seringes-et-Nesles, France, by the bullet of a German sniper. William Tally Mallon was buried in France but later re-interred in Galbally, Dungannon. Galbally Graveyard is about 3 miles from Donaghmore. From Donaghmore, follow the signs for Galbally along the Gortnagola Road. At the crossroads with Dernanaught Road take left. Over the small hill, the chapel and graveyard lie on the left hand side around 200 meters on that road. 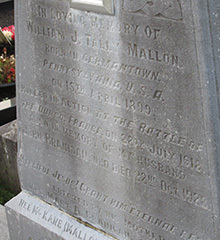 3 William T Mallon information Irish born or Irish American soldiers from other wars buried in Ireland or other places.